It was Panneerselvam who proposed the name of VKSasikala as the leader of AIADMK legislature party leader. In a big change of guard in Tamil Nadu government, Sasikala Natarajan was on Sunday elected as the Legislative Party leader of the AIADMK. She was unanimously elected by the AIADMK MLAs at a party meeting in Chennai. The roads are now clear for Sasikala, the general secretary of AIADMK, to replace O Panneerselvam as the chief minister of Tamil Nadu. It was Panneerselvam who proposed the name of V K Sasikala as the leader of AIADMK legislature party leader. 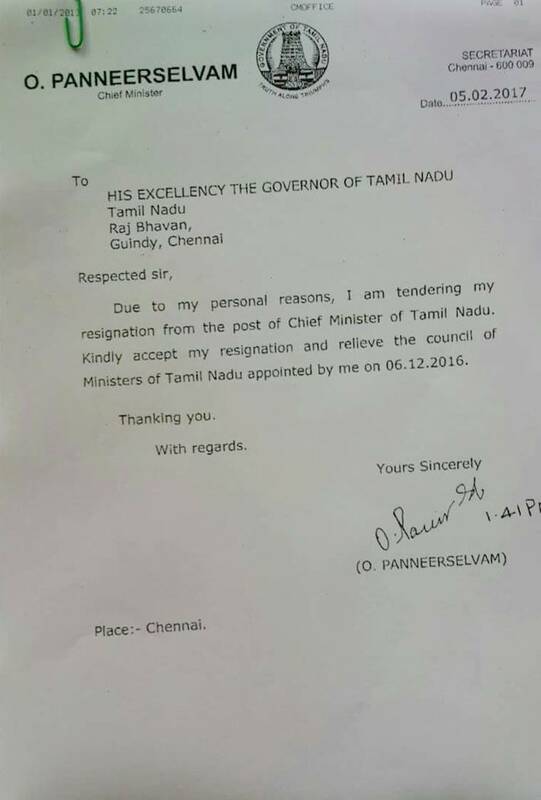 O Panneerselvam cited personal reasons and tendered his resignation from the post of the Chief Minister of Tamil Nadu. “Following the demise of Honourable Amma, it was Thiru. O.Paneerselvam who urged me first to take charge as the GS of AIADMK. It was Paneerselvam who insisted first, that I become the Chief Minister of the State,” Sasikala Natarajan after being appointed the head of the legislative party. “We are very happy and hope that Sasikala Natarjan becomes Chief Minister as she will follow Jayalalithaa’s steps”, said party members outside AIADMK Headquarters. According to government sources, VK Sasikala will be sworn in as Tamil Nadu Chief Minister on February 7. Earlier, Panneerselvam and other ministers met Sasikala at the Poes Garden residence of Jayalalithaa where Sasikala continues to live. The meeting of the legislators was called at short notice, a day after Sasikala appointed some former ministers and others who had been earlier shunted out by Jayalalithaa to various party posts. Jayalalithaa died in December following a prolonged illness. Sasikala had been the erstwhile AIADMK leader’s confidante for a long time. On Friday, Sasikala had appointed senior leaders, including some former Ministers and a former Mayor, to key party posts. Former Ministers K A Sengottaiyan, S Gokula Indira and B V Ramana, besides ex-Mayor Saidai S Duraisamy were made the AIADMK’s Organisation Secretaries. The appointments also included that of Fisheries Minister D Jayakumar to a key party post. She had also announced removal of Ambattur MLA V Alexander as AIADMK’s MGR Youth Wing Secretary. He will, however, continue as the party’s Tiruvallore (East) District Secretary, Sasikala had said in a statement. Last month, Thambidurai had said that the leadership in both the party and governance should be with the same person, while urging Sasikala to take over as Chief Minister. He had cited the political tussle in Samajwadi Party in Uttar Pradesh to drive home his point that the control of government and party should vest with the same person. Sasikala was appointed as General Secretary by AIADMK’s top decision-making body General Council on December 29. She took charge of the post on December 31, pledging to take forward the legacy of Jayalalithaa. In December last year, four state ministers had asked Sasikala to become the Chief Minister, besides AIADMK General Secretary. A resolution to this effect was passed at a meeting of Tirunelveli Urban Jaya Peravai (Forum), led by state AIADMK secretary and revenue minister R B Udhayakumar on December 17.